As was the case with most of the units that made up the Fifteenth Air Force, there are stories that help to describe what was experienced by the men serving during WWII. The following stories are good examples coming from the files of men who actually served or from their relatives. 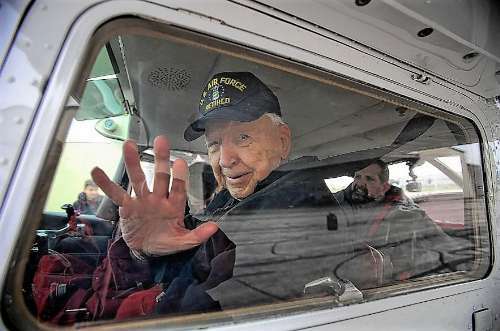 Col. Charles D. Allen, once a pilot in the 760th Squadron, 460th Bomb Group takes one more flight to celebrate his 100th birthday. Click on the photo above to read the story. Brief History of the 460th - Although more could be said about the 460th Bombardment Group (H), this provides a good summary of it's activities. Blechhammer - Blechhammer was one of the biggest targets the Fifteenth Air Force had during WWII. This is the story of that target. Spinazzola - Being the closest large town to the 460th Bombardment Group (H), Spinazzola holds many fond memories for members of the group. Poggiorsini - Although this small village was off limits to members of the 460th Bombardment Group (H), some members may remember it as it was less than a mile from the base. Wiener Neustädter Flugzeugwerke - Being a major center for the production of the German war machine, Wiener Neustädt became a major target for the Fifteenth Air Force. Awards and Decorations - The history of awards and decorations is interesting. A Trip to Germany - A story about a mission to Germany during WWII. Leland Brice Hall - My last and worst mission on April 25, 1945. Mission to Blechhammer - Lt. Robert A. Scott story of the mission on 7 July 1944.